If there is one destination about which I receive more questions than any other, it’s Alaska. I’ve shared many times and am open with friends and family that I love talking about the place where I grew up, just outside of Anchorage, Alaska. I travel back to explore my ‘home’ state with some frequency (about every 3-5 years), and I worked for three summers in hospitality. I love answering questions and giving tips about how to visit Alaska! In all my time of writing on this blog, I’ve never detailed exactly the trip I would recommend to a first-time traveler to Alaska. If you’re going to visit Alaska – a destination many people dream of visiting for years – you’ve got to do it right. As a local and one who has worked in hospitality, I’m happy to share all my knowledge and tips so you can have an amazing trip. Okay, friends. Let’s do this! Note: This post has been updated for 2019 to reflect accurate prices and times for all suggested activities and accommodations. If you see an error, please let me know in the comments or email me. Alaska is a bucket list destination for many travelers, so there are some important details to know before you start booking your trip. Similar reasons make visiting in the shoulder season (spring and autumn) appealing. If you’re on the fence, I put together a list of reasons to visit Alaska in the spring (these apply to autumn too). If you’re looking for the best weather, it’s undeniable that the best months to visit Alaska are June through August. These are the months with the best weather – most sun and least rain – and warmest temperatures. Unfortunately, this short peak season means you’ll be visiting at the same time as every other traveler, so consider whether shoulder or off-season travel might be a better option for you. Almost all of the activities I recommend in this post are only available in the summer months. If you’re planning a trip in the spring, autumn, or winter, be sure to check available dates before you book. Many people visit Alaska as part of a cruise or guided tour, as these tour operators make it easy to see popular cities and sights without worrying about logistics. While it’s definitely easier to book with a tour operator or guide, it’s not too hard to visit Alaska on your own and book everything independently. Alaska may be ‘The Last Frontier,’ but it has all the modern amenities you need, and with a smartphone or map, you can easily navigate yourself around the large state. Alaska is not a cheap destination, especially in summer when prices are higher because of the tourist season. Many “normal” conveniences (like groceries and food) will be more expensive, as they need to be imported from the “Lower 48.” Though a lot of oil comes from Alaska, gas prices are not significantly cheaper; you can expect a gallon of gas to cost roughly the same as one in New England. Pack layers! You can always take them off. Pack rain gear. You don’t want to spend the whole trip feeling damp and cold. A hat, gloves, and scarf can’t go wrong, even in summer. Skip the skimpy shoes and opt for sturdy walking or hiking shoes. Throw sunglasses and an eye mask in your bag. That Midnight Sun is bright! See the full packing list here. Let’s break each one down! Why I recommend the train: While it’s significantly faster to drive to/from Denali and it makes your Day 6 travel time substantially shorter, the Denali Star route cuts through one of the most beautiful parts of Alaska. Also, when you’re in Denali, you don’t really need a car. Most hotels offer a shuttle to/from the train depot, and most of the tour companies will pick up and transfer you for any tours you book. Why I recommend renting a car: The Coastal Classic train route is beautiful, but the highway to Seward goes along much of the same route. You also need a car to get to/from most hotels and other excursions I recommend in the Seward area (like Exit Glacier). I hope that helps you plan your trip – obviously the final choice is up to you! Here’s the quick version of a 10-day itinerary for Alaska. You can read below for greater detail. Note that this estimated time on the map is based on driving the entire route, not taking the Alaska Railroad. Depending on your city of origin, it may take almost one full day to fly to Alaska. For example, from Seattle, most flights to Alaska leave in the afternoon or evening, and you arrive in Anchorage late in the day. If you’re arriving in Alaska via cruise ship, it will take most of the day to disembark and travel from the ship to Anchorage. Cruise companies typically use Anchorage as a base for “land excursions” in the state, so you can expect to catch a bus or train from Seward or Whittier to Anchorage on your day of disembarkation. Given that you’re arriving in Anchorage during the evening, don’t plan much for your first day between settling in. If, as this itinerary proposes, you decide to travel Alaska on your own (without a guide), you won’t need a rental car until the morning on Day 3. For now, it’s best to settle into your Anchorage accommodation and enjoy dinner. Book 2 nights + 1 more night for Day 5 all at the same time; it may help to call and arrange this directly with the hotel rather than booking through a third-party site. For hotels, I recommend the Hotel Captain Cook (from $175/night) or Hilton Anchorage (from $191/night). Both are right in the heart of downtown Anchorage and you’ll be within easy walking distance to the top things to see and do. For Airbnb, this guest suite (from $59/night) is in a great location, this little house (from $119/night) is super cute and spacious for a group, and this apartment (from $160/night) covers all the bases. For dinner, try the Glacier Brewhouse, 49th State Brewing, or Humpy’s. Since I grew up just outside Anchorage, I could easily give you a week worth of things to do, but let’s try and keep it to just one day – there’s so much to see in Alaska and it’s such a big state that you need the rest of this itinerary to see other amazing sights! If you’re in Anchorage on a weekend, be sure to add the Anchorage Market & Festival to your list. This downtown market features local gifts and vendors, musicians and performers, and some really delicious food. On a good day, you’ll also have great views of the surrounding mountains and scenery from the edges of the Market. On my most recent trip, I also made a visit to the Anchorage Museum, which has undergone massive renovations since my family moved away from Alaska 10+ years ago. From a Smithsonian-sponsored exhibit on the Native cultures of Alaska to the classic Alaskan artwork in the original part of the Museum, the exhibit on Alaska’s unique relationship with Russia to the “Imaginarium” downstairs where kids and alike can experience science first hand… the museum is a surprising delight. Stay in the same accommodation for Day 2. For lunch, eat at the Anchorage Market or at Tia’s Reindeer Sausage on 4th Avenue. For dinner, book a table at the Crow’s Nest. The views are stunning. While I have most commonly driven between Anchorage and Denali, I highly recommend the Alaska Railroad, since it offers a unique experience of the Alaskan Wilderness as well as great service and the ability to relax the whole way. If you choose to drive, be sure to keep an eye out for the mountain of Denali (here are some of my favorite Denali viewpoints). Note: If you drive to Denali, stop at Miller’s Landing and get a huge ice cream cone! Book 3 nights in Denali. Denali has a limited number of accommodations in the small town; I recommend basically all of them, including the Grande Denali Lodge (from $329/night), McKinley Chalet Resort (from $149/night), or Cabins at Denali. There aren’t a ton of Airbnb options near Denali National Park, so you’ll need a car if you choose to stay in an Airbnb instead of a hotel right in town. This house (from $370/night, good for families or small groups) or this house (from $550/night, good for large groups) are both good options. For dinner, head to Lynx Creek Pizza. Order the ‘Polychrome Pass’ with artichoke hearts added. You’re welcome! Another dinner option is the Salmon Bake. This Denali-area institution draws a local crowd and they serve a massive blue margarita named after the mountain. Today, rise early and board a bus into Denali National Park. Most of Denali National Park is not accessible by private vehicle, so National Park Service buses are the only way to really get into the park, see wildlife, and potentially, see the mountain of Denali herself. Tundra Wilderness Tour: 7-8 hours in the park to either Mile 53 (Toklat River) or Mile 62 (Stony Overlook). To be honest, I don’t believe it’s worth it to go for any less than the Tundra Wilderness Tour. The DNHT (so-called by the National Park Service) is interesting but caters more toward travelers that can’t handle sitting on a school bus for long periods of time. The tour will give you a flavor of the park, but will definitely leave you wanting more. The TWT is much more palatable, and a good duration at 7-8 hours long. There’s an optimal chance to see wildlife, and you’ll ride along a significant length of the park road. If you’re up for a 12-hour day, go all the way and book the Kantishna Experience. I’ve only done this once when I was very small, but I remember being amazed at how big the park was! Stay another night at your booked accommodations. Depending on the length of your tour, you may want to book a seat for Alaska Cabin Nite, a dinner theater show that’s both cheesy and charming. Tickets are $75 per person. Denali Bus Tours started from $85.50 per person in the 2019 season. Because Denali and Denali National Park are almost too big to comprehend, I recommend taking two full days here. It will give you a true sense of the scale of Alaska, and a better chance of seeing the mountain while visiting. On this day, book the 8:30 am guided flightseeing tour with Fly Denali. They are my preferred provider after trying many of the flightseeing providers in the area when I worked in Denali one summer. Their Denali Glacier Landing tour is expensive at $549 per person, but 100% worth it. You’ll spend almost 2 hours in the air, plus 20 minutes on a glacier on Denali itself. So cool (literally and figuratively – there’s always snow!). At 12:30 pm, catch the Alaska Railroad south to Anchorage. You can enjoy dinner aboard the train before arriving in Anchorage for the evening. Note: If you chose to drive to Denali, you have some flexibility in this schedule. Stay another night in Anchorage. As advised above, I recommend booking this night when you book the earlier nights in this itinerary. The Fly Denali Glacier Landing tour is $549 per person. The only time for the flightseeing tour that works in this itinerary is 8:30 am, so be sure to book in advance. It is a 2.5-hour drive from Anchorage to Seward. While the Seward Highways is known as one of the more dangerous highways to drive, it is reasonable to drive as long as you are aware of other drivers and don’t take risks while driving or park on the side of the highway to look at whales or Dall sheep. The train from Anchorage to Seward leaves at 6:45 am – yuck! The rest of this itinerary works much better if you have a car to get around. After making the 150-minute drive from Anchorage to Seward, you’ll have most of the day to explore the city. Spend a few hours at the Alaska SeaLife Center in downtown Seward; you can see a variety of sea creatures including several in rehabilitation or research studies. In the afternoon, head to Exit Glacier, just north of Seward. 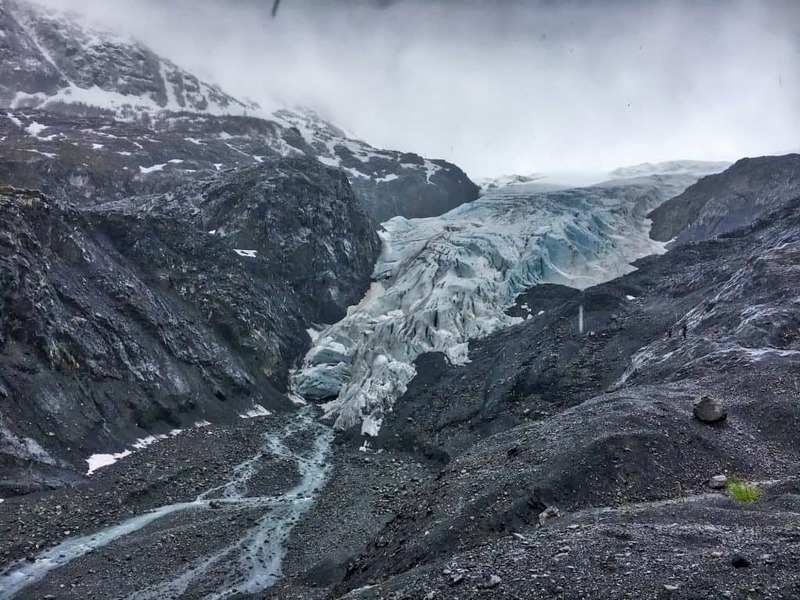 As I mentioned in my post about hiking in Alaska, Exit Glacier has a bunch of hiking trails and it’s easy to get pretty close to Exit Glacier and learn more about how glaciers have shaped the Alaskan terrain. Book two nights in Seward. For hotels, I recommend the Van Gilder Hotel (from $184/night) or the Seward Windsong Lodge (from $319/night). For Airbnb, this cottage (from $95/night) is super cozy, this studio (from $132/night) is well-located for walking everywhere, or you can be adventurous and stay in this funky quonset hut (from $100/night)! For dinner, head to Seward Brewing Company. The menu is exciting and a bit experimental (sea salt watermelon salad, anyone?) but delicious. Admission to the Alaska SeaLife Center is $24.95 per person. Today, you’ll board a sightseeing tour in Seward that will take you out into Kenai Fjords National Park. As the name suggests, these fjords are massive waterways that are home to some of Alaska’s greatest sealife, including humpback and orca whales, seabirds like puffins, and plenty of otters. My preferred tour provider in Seward is Major Marine Tours, though there are others to chose from. I’ve taken several tours with Major Marine Tours over the ages and put together a review of two different tours I’ve done recently: the 6-hour Kenai Fjords National Park Cruise and the 7.5-hour Kenai Fjords National Park Cruise. As this tour will take up most of your day, the rest of the day can be spent at your leisure. Stay another night at your Seward accommodation. For dinner, try The Cookery. I’ve never been, but it has rave reviews on TripAdvisor. The Major Marine Tours 6-hour tour is $159 per person; and the 7.5-hour tour is $179 per person. Click here to see all full-day tour options and tickets and be sure to book in advance during busy summer months. For Day 8 and 9, the pace of travel slows significantly; there’s much less time spent traveling and more spent relaxing and/or looking around at the sights. After the second night in Denali, the goal is to reach Girdwood on Day 8, a 1.5-hour drive. En route, I recommend taking a small detour to enjoy lunch and walk around my favorite small Alaska town, Hope. There isn’t a ton to do in Hope, but it gives you a good picture of what life is like outside the “cities” in Alaska. Enjoy lunch at the Sea View Cafe, walk along the river, and try your hand at gold panning. In Girdwood, spend the afternoon by taking the Alyeska tram up Alyeska mountain. This tram is part of the Alyeska Resort and takes about seven minutes to bring you up the mountain. En route, you’ll see hanging glaciers on nearby mountains, and maybe even some wildlife in the landscape below. Once you’ve arrived at the top of the tram, you can hike around (this is another easy hike I recommend for first-time travelers to Alaska) or enjoy dinner at Seven Glaciers restaurant. If you want to have dinner, be sure to book a reservation in advance. Book two nights in Alyeska. For hotels, your options are a bit limited, but The Hotel Alyeska (from $133/night) is worth the splurge, or the Ski Inn (from $70/night) offers a more budget-friendly option. For Airbnb, this log cabin (from $120/night) is a perfect mountain home base, this guest suite (from $110/night) is nicely modern, or you can stay at this alpine home (From $104/night) with a hot tub. If you want to splurge on dinner in a different style, head to the Double Musky. This is my parent’s favorite restaurant, and they also have rooms. Tram tickets start from $29 per person. Portage Glacier Tour – A short boat tour to see Portage Glacier, an easily accessible glacier. Alaska Wildlife Conservation Center – A facility where many species of native Alaskan animals live permanently or in rehabilitation. This gives you a good chance to see some animals you may have missed while traveling. Both of these activities will take a few hours, so you could do one in the morning and another in the afternoon at your leisure. Stay a second night at your Girdwood accommodation. For dinner, head to Jack Sprat in Girdwood. This dinner spot has a delicious, hearty menu. The Portage Glacier Cruise is $39 per person. Admission to the Alaska Wildlife Conservation Center (AWCC) is $15 per car. Go for a short hike at McHugh Creek, a day-use hiking area. Walk along the boardwalk at Potter Marsh, a huge wetland where you can still occasionally spot a moose. Go for a hike up Flattop, one of Anchorage’s popular hiking mountains near the city. Watch airplanes land at Earthquake Park near the Anchorage airport. At the end, you’ll need to board a plane home at Ted Steven’s International Airport. Many flights are red-eye when heading east toward the contiguous United States, so settle in for the long flight with dreams full of your Alaskan adventures! Have other questions about traveling to Alaska? Let me know in the comments! This post was published in September 2017, and was updated in October 2018 and March 2019. Such a great re-cap! I cant wait to go one day!! Thanks, Ruthie! I hope you can make it! Alaska has never really been on my radar but looks so much fun! My best friends dad has a hunting resort in Alaska! Oh very cool! Do you know where the resort is?? Alaska is totally on my bucket list!! My parents went a few years ago and I was so jealous then, and even more jealous now! It’s pretty amazing, I hope you can visit someday! This post is so, so helpful! Definitely pinning this for later. I’m one of the many who would love to go to Alaska someday. I wouldn’t mind going during winter or spring, either. Thanks, Crystal! I hope you can make it at least sometime in the future, no matter the season! Wow! Such great and detailed info! I realllllly want to make a trip to Alaska. It’s on my short list! Thanks for sharing your knowledge! I need this trip Planning Aug -Sept 2018 Nothing is mentioned about Fairbanks or Talkeetna. If I want to add a few days here would you give me some ideas. Also my first thought when I began planning was to start in Fairbanks Thoughts? Ruth, if you’re adding extra days, it should be no problem to add in Fairbanks for sure — you don’t really need more than a day there, and you definitely don’t need more than a day in Talkeetna. If you want to do Talkeetna though, you probably need to rent a car and make the drive from Fairbanks > Denali > Talkeetna > Anchorage. Ruth, sorry I missed your reply! This sounds like a great trip. You have 2 weeks for Fairbanks > Denali > Talkeetna > Anchorage? Thanks for sharing this itinerary! We’re planning our first trip to Alaska this year… my partner wants to go for 2 weeks in the summer (July) but after reading your blog I’m wondering about late June/early July! Is 10 days sufficient to fit in a few decent hikes and still see Denali and Seward. I’m also worried Denali may not be open at this time. What’s your thoughts? I’m mainly motivated by the price but your ‘reasons to visit in Spring’ post did make me think maybe money isn’t the only reason! I would highly recommend June over July — there’s a joke among locals that July 4th marks the start of rainy season in July! I think 10 days is enough for what you’re suggesting, but it’s worth clarifying: are these “decent hikes” day hikes? Or multi-day hikes? Also, Denali will definitely be open! Summer is a great time to visit the park. Be sure to research backcountry camping/hiking through the Park Service if that’s on your itinerary. Becky, Memorial Day to July is the sweet spot — I was there Memorial Day weekend 2017 and it was great weather! – Day 10 – Are you planning to enter Hatcher Pass on the west side and exit on the east side? Google’s mapping it at 5 hours but NOT by traversing Hatcher Pass (not a well maintained road). Be sure to try and figure out if the Hatcher Pass road is even open before trying to cross it (link: http://dnr.alaska.gov/parks/units/hatcherpass/hatcherpass.htm)… looks like it only opens on July 1st typically. We’re pretty used to long drives (last year we drove from California to Montana) so am happy to do it. We plan to leave very early and take our time. Thanks for pointing out about Hatcher Pass – I’d given it no further thought than “oh that’s on the way” (must do some more research). You’ve sold me on a May trip! Many thanks for sharing this itinerary, as we (a family of three, including our 7 year old daughter) are planning the same trip from 30th of April to 9th of May 2018. We are from India (wrong side driving) and will be carrying our IDP, and wanted to know the rules & tips while renting out a car in Anchorage. Finally will the rules allow us to drive with our Indian license & International Driving Permit (IDP)? Finally is it a good time of the year to do the same itinerary? Avijit, sorry I missed your comment. Your IDP should be sufficient, but I recommend checking the terms of your rental car reservation to be sure. Hi , thanks so much for itinerary, sounds like fun. I am planning a trip for my son 21 and myself. We want to do kayaking, water rafting, salmon fishing and dog sledding. Can you suggest where would I go to do that in your itinerary ? My husband and I would love to visit Alaska for our next vacation. Your advice on how to plan our trip is very helpful. I think it would be best to find a vacation package, though. Thanks so much for reading, and for your comment Sarah! I hope you have a great trip! Thank you for suggesting an awsome 10 day iternary. I have been searching for this and your’s definately tops among few others! We are family of 4 ,kids are 19 and 21 years old, we are outdoorsy and love to do outdoor activities. We are planning to visit in early august this year for 10 days on ground and 2 days for airline travel from California, we were thinking of driving to fairbanks on day 1 via delta juction and stay a night at fairbanks and then go to denali the next day from Fairbanks and that way we can see the little city of North Pole ….but we dropped that idea as we thinking it might be too much but we do want to add Homer to this iternary, what do you suggest? Thanks for your comment, Vipinder. I think you’re trying to squeeze too much in, to be honest. I’m also not as familiar with Fairbanks and interior Alaska. Good luck planning your trip! I’ve looked a dozens of suggested itineraries and I think yours is the best I’ve read. We’re planning on using almost this exact itinerary when we go in mid August this year however I had looked at and really wanted to add in Wrangell St. Elias National Park for a few days of hiking and wondered if you had any thoughts on that. Thanks Valerie! Thanks so much for your kind words, Bill! I’ve actually never been to Wrangell St. Elias… so I’m not much help there! Have an AMAZING trip! Thanks for putting this up for people to use. We are from Brisbane Australia. We have spent time in Canada a few years ago but missed Alaska. We are coming back for a second visit to Alaska this time in August 2019. We will then travel from Seward to Anchorage on the 23rd by train and stay in Anchorage over night. We have already arranged the hire of a car in Anchorage from the 24th August until the 2nd September. From there I am up for suggestions from yourself or locals on what to see and do. We love the outdoors and wildlife but aren’t big hikers. The thing that I have gathered so far is that I need to stay 3 nights at Denali. The rest is up for grabs. I have ready your itinerary for 10 days. How would you suggest adjusting it to suit the stuff that we have already booked? Mark, thanks for reaching out! I’d recommend maybe 3d/2n in Anchorage (maybe 1 night at the beginning and one at the end), 4d/3n in Denali, and 3d/2n in Fairbanks (I don’t know Fairbanks too well, so Google is your friend here!). That makes the most sense given the time you have! You won’t be moving at a fast pace like my original itinerary, but you’ll have plenty of time to enjoy what each place has to offer. I hope that helps give you some ideas! Do you have suggestions for landing in Fairbanks to Denali? Itinerary suggestions with tips for Arctic Circle tour and town of North Pole, worth visit? We Riverboat? Susette, sorry, I’m not familiar with Fairbanks. Alaska’s a pretty big place so it wasn’t close enough to visit often, and I was only there a few times.